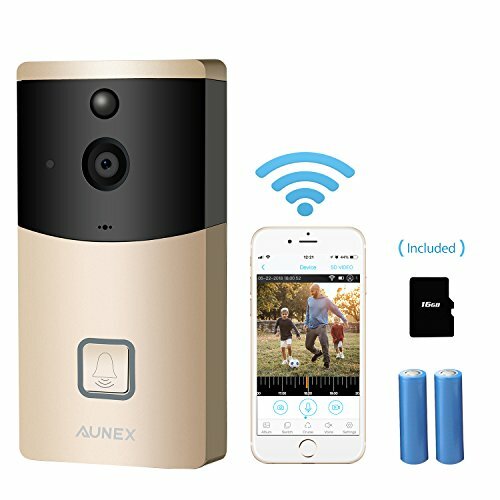 ADVANCED PIR MOTION DETECTION AND INSTANT ALERT - Aunex video doorbell enables you to supervise your door anywhere anytime. Get instant alerts when visitors press your doorbell or trigger the built-in motion sensors. With 720p ultra hd video and smart night vision, no matter in the daytime or at night, you can see what happen around your door with infrared night vision. REAL-TIME VIDEO TWO-WAY AUDIO and 166°WIDE ANGLE LENS - This doorbell camera allows you to talk to your visitors wherever you are. And you can watch real-time videos on your cellphone, it supports multi-device control. Playback mode available on this video doorbell, you can check the history after you insert a micro sd card. 166°visual angle provide wider angles and less dead zones.Make sure you don\'t miss any visitors and secure your home day and night. EASY INSTALLATION - No wires or cables are required, just install the smart doorbell on the door or wall and download the APP, then use 2.4G wifi to connect the doorbell.The 2.4GHz Wi-Fi range is up to 20m (66ft). Dual powered, the device can work with one rechargeable 18650 battery (INCLUDED) or AC adapter. DOUBLE SAFETY PROTECTION AND ANTI-THEFT - This doorbell ring has been CE and RoHS certified. The battery contains international insurance and safety protection circuits. Contains anti-theft screws and receives an alarm if stolen, waterproof level IP42, giving you more at ease use, Widely used in homes, apartments, factories, companies, etc. 30-DAY MONEY BACK GUARANTEE AND 2 YEAR WARRANTY - We provide excellent customer service, 30-day money back guarantee, 2 year warranty and lifetime technical support. if you are any question with the wireless doorbell, please contact us. Great doorbell , love this doorbell!